When you buy a house you don't always know what you are getting into. Sometimes you buy a house that has a dryer that works but will shred your clothes to pieces in less than 3 minutes or you'll buy a house that only has one outlet in the entire kitchen. Well we bought a house that has many trees in the backyard and one of them happens to be a mulberry tree and right below the tree is a bunch of bushes that I haven't gotten around to clearing yet. Well luckily I was lacking motivation because those unsightly bushes are producing blackberries. 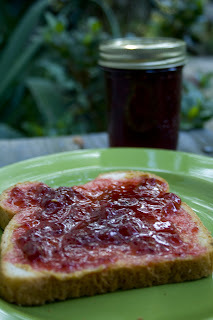 Those 2 berries combined with strawberries from our local farmer's market has produced the most tasty jam! I've never tasted mulberries before but apparently they are pretty popular in China. Traditionally, mulberry fruit has been used as a medicinal agent to nourish the yin and blood, benefit the kidneys, and treat weakness, fatigue, anemia, and premature graying of hair. Who would have thought! And in my backyard! That's awesome. We used to have wild growing raspberries in our backyard when I was growing up and I looked forward to them growing every summer.